As Benjamin Franklin is famous for saying, “An ounce of prevention is worth a pound of cure.” The health of your sanitary sewer system is similar to our personal health. We take measures to stay healthy by getting a flu shot, going to the doctor for an annual checkup, eating well-balanced meals, and exercising 30 minutes daily. We hope by being proactive with our health maintenance, we will prevent illness. The same is true for your sewer system. If you maintain your sewers, you can minimize costly repairs. Ready to get healthy? Here are 11 steps to help you get started. Use Global Information System (GIS) mapping to understand your system. An effective sewer maintenance program revolves around knowing the location of all infrastructure, pipe sizes, lengths and material of pipes, and depth and material of manholes. Use GIS mapping to track completed rehabilitation and replacement work. Inspect the manholes on a schedule. Depending on the size of your system and staff availability, this may be once a year, or every other year. This will alert you to issues such as excessive debris or blockages in the system, structural issues, and inflow and infiltration sources. Document the inspections using manhole inspection forms for tracking maintenance and rehabilitation needs. Complete a draw down test if you have lift stations. This test verifies proper pump performance and should be conducted annually at every lift station to identify issues with floats, isolate excessive grease, and confirm check valves are functional. While conducting the tests, we recommend you check the Air Relief pits to make sure the ball valves are operating efficiently and not clogged. Verify your community has an ordinance requiring grease traps at businesses. Restaurants, gas stations, car washes, or other businesses that discharge fats, oils and grease (FOG) should install a grease trap to avoid clogging the sewer system. We suggest performing random inspections to ensure proper installation and maintenance of the grease traps. Perform construction observations on sanitary sewer installations for new development. One of the biggest problems we run into is sanitary sewers that were not properly bedded. Offset frames and covers, chimney damage, and broken pipe are a few of the problems resulting from improper new construction activities. Ensure your sanitary sewer mains are identified prior to trenching, drilling, or boring installations to avoid conflicts with your sewer. Once the new infrastructure is installed, perform required air and mandrel testing on sewer mains, and vacuum testing on manholes, to confirm proper construction. We encourage you conduct a warranty inspection prior to the warranty expiration (or maintenance bond) to verify whether issues with materials or workmanship have developed during the elapsed timeframe. Execute cleaning and jetting of the sewer mains. 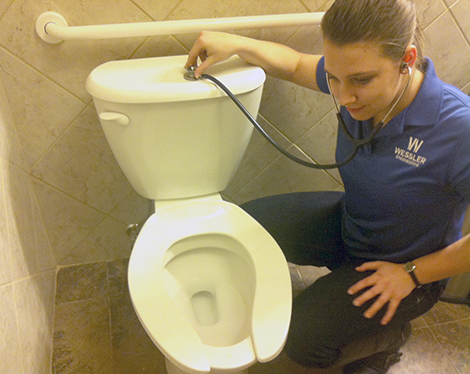 Establish a routine maintenance program that includes cleaning of the sanitary sewers. This process will remove debris buildup and attached deposits to ensure your system is flowing properly and capacity is not being compromised. Perform closed circuit television (CCTV). After cleaning and jetting, conduct CCTV of the sewer mains to identify leaks or pipe defects in the system. Conduct sump pump inspections. These residential inspections will determine connections to the sanitary sewer system. Most municipalities have an ordinance prohibiting illicit sump pump connections. Perform smoke testing. This is a quick and efficient method for detecting storm sewer connections, roof drain connections, or defective sewer laterals, which are contributors of inflow and infiltration. Conduct wet-weather inspections. These inspections can provide valuable information on how precipitation and groundwater conditions affect the sewer flow. Although some manholes may appear in good condition during dry weather, those same manholes may exhibit leaking joints, missing mortar, and open pick holes in low-lying areas during wet-weather inspections. Prepare an O&M Manual for your sanitary sewer system. An O&M manual will contain information on your maintenance schedules, how to report sanitary sewer overflows, an emergency contact list, and inspection procedures, which can be helpful when training your new department of public works’ staff. Similar to practicing a healthy lifestyle, maintaining a sewer system takes time and commitment. Following these 11 steps will help you retain the general health of your system. As we all know, preventing a problem is much cheaper and timesaving than repairing it after it happens.